anomalize enables a tidy workflow for detecting anomalies in data. The main functions are time_decompose(), anomalize(), and time_recompose(). 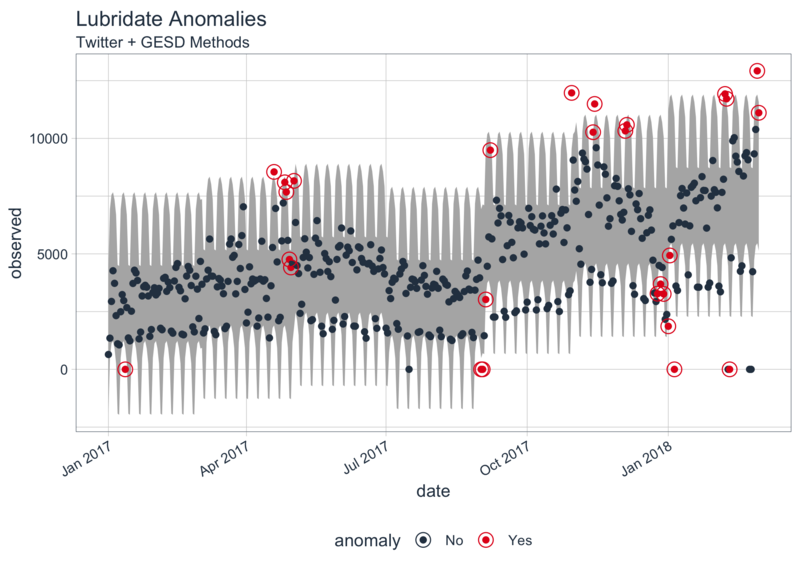 When combined, it’s quite simple to decompose time series, detect anomalies, and create bands separating the “normal” data from the anomalous data. Check out our entire Software Intro Series on YouTube! time_recompose(): Calculates limits that separate the “normal” data from the anomalies! Load the tidyverse and anomalize packages. Next, let’s get some data. 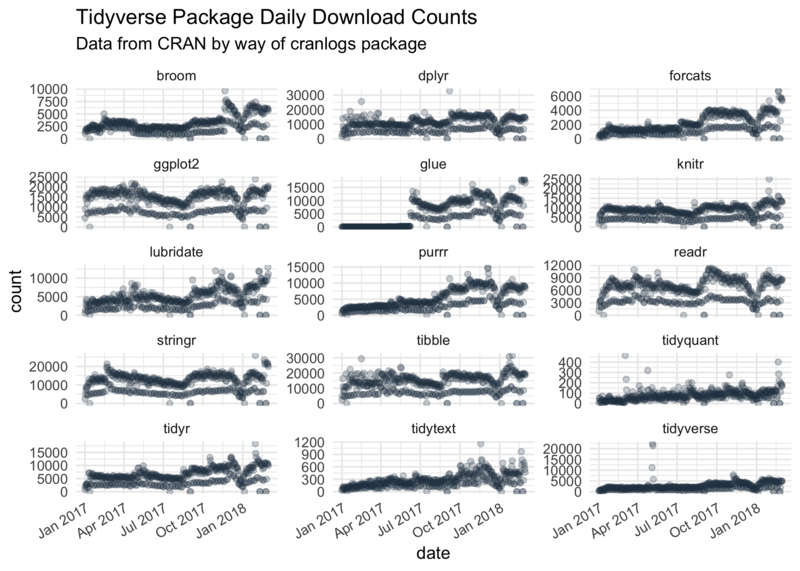 anomalize ships with a data set called tidyverse_cran_downloads that contains the daily CRAN download counts for 15 “tidy” packages from 2017-01-01 to 2018-03-01. Suppose we want to determine which daily download “counts” are anomalous. It’s as easy as using the three main functions (time_decompose(), anomalize(), and time_recompose()) along with a visualization function, plot_anomalies(). If you’re familiar with Twitter’s AnomalyDetection package, you can implement that method by combining time_decompose(method = "twitter") with anomalize(method = "gesd"). Additionally, we’ll adjust the trend = "2 months" to adjust the median spans, which is how Twitter’s decomposition method works. Last, we can compare to STL + IQR methods, which use different decomposition and anomaly detection approaches. time_frequency() and time_trend() for generating frequency and trend spans using date and datetime information, which is more intuitive than selecting numeric values. Also, period = "auto" automatically selects frequency and trend spans based on the time scale of the data. plot_anomaly_decomposition() for visualizing the inner workings of how algorithm detects anomalies in the “remainder”. 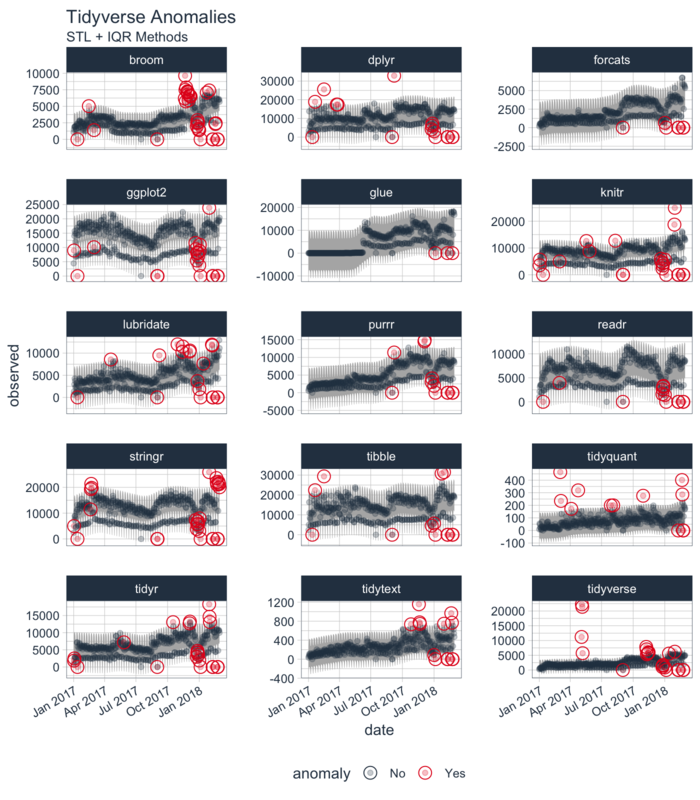 Vector functions for anomaly detection: iqr() and gesd(). These are great for just using on numeric data. 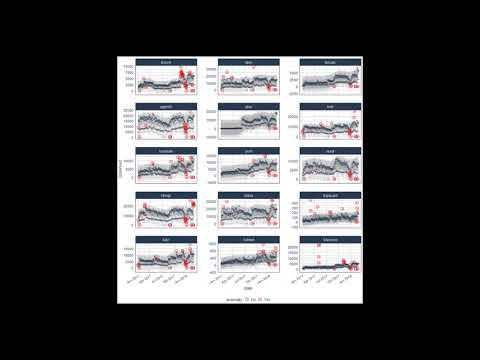 Note that trend and seasonality should already be removed for time series data. #>    "No"  "No"  "No"  "No"  "No"  "No"  "No"  "No"  "No"  "No"  "No"
#>   "No"  "No"  "No"  "No"  "No"  "No"  "No"  "No"  "No"  "No"  "No"
#>   "No"  "No"  "No"  "No"  "No"  "No"  "No"  "No"  "Yes" "No"  "No"
#>   "No"  "No"  "No"  "Yes" "No"  "No"  "No"  "No"  "No"  "No"  "No"
#>   "No"  "No"  "Yes" "No"  "No"  "No"  "No"  "No"  "No"  "No"  "No"
#>   "No"  "Yes" "No"  "No"  "No"  "No"  "Yes" "No"  "No"  "No"  "No"
Anomaly Reports: Using verbose = TRUE, we can return a nice report of useful information related to the outliers. #>  1 2017-01-01     643. -2078. 2474. 246. -3323. 3310. #>  2 2017-01-02    1350. 518. 2491. -1659. -3323. 3310. #>  3 2017-01-03    2940. 1117. 2508. -685. -3323. 3310. #>  4 2017-01-04    4269. 1220. 2524. 525. -3323. 3310. #>  5 2017-01-05    3724. 865. 2541. 318. -3323. 3310. #>  6 2017-01-06    2326. 356. 2558. -588. -3323. 3310. #>  7 2017-01-07    1107. -1998. 2574. 531. -3323. 3310. #>  8 2017-01-08    1058. -2078. 2591. 545. -3323. 3310. #>  9 2017-01-09    2494. 518. 2608. -632. -3323. 3310. #> 10 2017-01-10    3237. 1117. 2624. -504. -3323. 3310. #>   "Yes" "No"  "No"  "No"  "No"  "No"  "No"  "No"  "No"  "No"  "No"
#>  "No"  "No"  "No"  "No"  "No"  "No"  "No"  "No"  "No"  "Yes" "No"
#>  "No"  "No"  "No"  "No"  "No"  "No"  "No"  "No"  "No"  "No"  "No"
#>  "No"  "Yes" "No"  "No"  "No"  "No"  "No"  "Yes" "No"  "No"  "No"
#>  "No"  "No"  "No"  "No"  "No"  "Yes" "No"  "No"  "No"  "No"  "No"
#>  "No"  "No"  "No"  "No"  "No"  "No"  "No"  "No"  "Yes" "Yes" "No"
#>  "No"  "No"  "No"  "No"  "No"  "No"  "No"  "Yes" "Yes" "No"  "No"
#>  "No"  "No"  "No"  "No"  "No"  "No"  "No"  "No"  "Yes" "No"  "No"
#>  "No"  "No"  "Yes" "No"  "No"  "No"  "Yes" "No"  "No"  "No"  "No"
#>  "No"  "No"  "No"  "Yes" "No"  "No"  "No"  "No"  "No"  "No"  "No"
#>  "No"  "No"  "No"  "No"  "No"  "No"  "Yes" "Yes" "Yes" "Yes" "No"
#>  "Yes" "Yes" "No"  "No"  "No"  "No"  "No"
#>   "Down" "Down" "Down" "Down" "Up"   "Down" "Up"   "Down" "Up"   "Down"
#>  "Up"   "Up"   "Down" "Up"   "Up"   "Up"   "Up"   "Down" "Up"
Twitter’s AnomalyDetection, which implements decomposition using median spans and the Generalized Extreme Studentized Deviation (GESD) test for anomalies. forecast::tsoutliers() function, which implements the IQR method. Developed by Matt Dancho, Davis Vaughan.